Rainscreen cladding, a construction type that first appeared on Norwegian barns around 100 years ago, has now become an industry standard for protecting and finishing buildings of all shapes and sizes in the UK. The more recent trend towards open-jointed cladding has produced not only unique architecturally aesthetic designs but has also sparked new advancements in rainscreen membrane technology. The purpose of exterior cladding in a closed-jointed system is to protect underlying structures from the elements, primarily wind, water, UV rays and fire. Contractors that specify open-jointed systems should understand that the porous nature of open-jointed cladding effectively removes its ability to protect. In order for open-jointed rainscreens to be successful i.e. for buildings with open-jointed cladding not to be leaky, drafty or moldy, and to alleviate fire-risk, the design of the exterior structure must account for the lack of protection the outer cladding would otherwise provide. Some designs transfer this responsibility to deeper layers in the buildup. Strategies include doubling up of the weather resistant walling underlay, using UV-rated insulation directly behind the cladding, significantly increasing the depth of the cavity to mitigate UV damage to the protective membrane, and even simulating open-joints by fixing panels or cultured stone back to a dark substrate to suggest a "shadow". 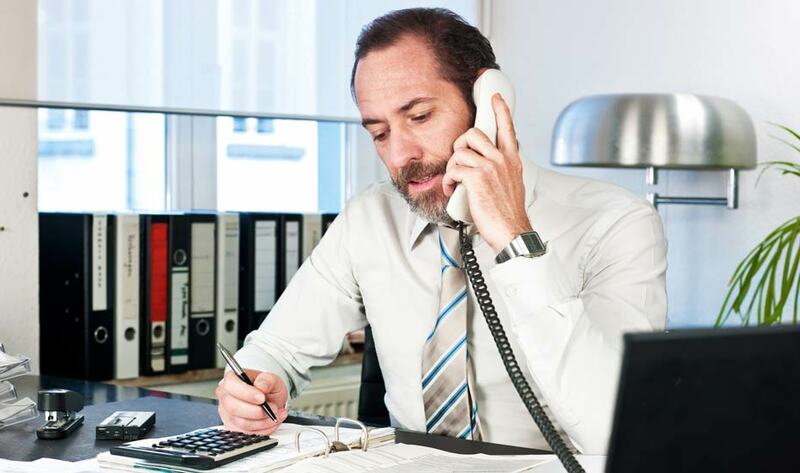 While there are few case studies on the effectiveness of these methods, the potential downsides include increased material and labour costs, complicated detailing, and an increase in building footprint, making these options less than ideal. The introduction of airtight, vapour permeable walling underlays that are water resistant, fire resistant and, importantly, UV stable so they can work behind open-jointed cladding has been a game-changing innovation to the industry. Using a vapour permeable, airtight membrane that is water and fire resistant, and critically, tested to be UV stable, is the superior option for protecting structures under open-jointed cladding. All breathable walling underlays should be installed by an experienced builder or general contractor according to published guidelines and standards e.g. BS5250:2011 + A1:2016, British Standard Code of Practice for control of condensation in buildings. 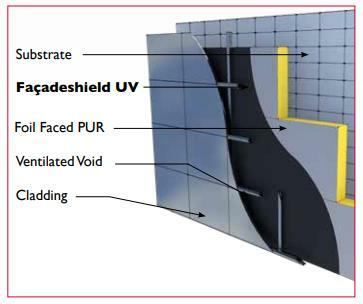 Fireshield® and Façadeshield® UV vapour permeable walling underlays have both been rigorously tested and meet the strict standards required for use under open-jointed rainscreens. 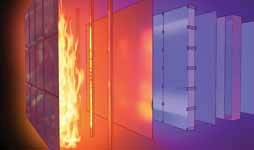 Both have Class B fire performance, which is one of the highest classifications for construction membranes, with Fireshield having the added benefit of an intumescent coating which actively reacts to prevent fire from taking hold. Fireshield and Façadeshield UV are dark grey to black in colour to produce the desired “shadow” aesthetic behind open-jointed cladding and are installed in the same manner as traditional breather membranes. 1. 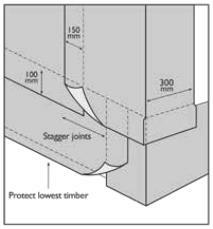 To protect the membrane from mechanical damage, open-joints in the cladding must be a max. 50mm wide and not more than 50% of the total façade area. 2. The membrane is fixed to the supporting construction mechanically using fixings appropriate to the substrate. 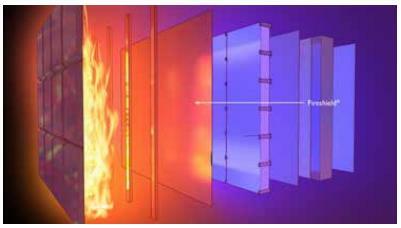 Consideration should be made of the fire performance of the fixings. 3. Unroll the membrane and fix directly to the substrate i.e. insulation/sheathing board ensuring the membrane is as dust and grease free as possible and the substrate dry and stable. Place fixings at centers not greater than 500mm. 4. Lap the membrane 100mm horizontally and 150mm vertically. Ensure vertical overlaps are staggered and horizontal overlaps are shingled to shed water away from the sheathing. At external corners return the membrane by 300mm. 5. Detail the membrane into openings to ensure the return provides sufficient lap and weathering protection for the proposed framing. Reflectafoil Tape, Façadeshield Tape or Flextite UV Tape may be used to seal the corners. 6. 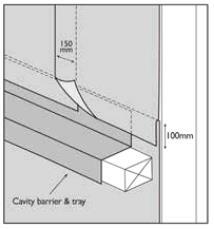 Lap membrane at cavity barriers and trays by a min. 100mm horizontally and 150mm vertically. 7. Seal around penetrations through membrane with Reflectafoil Tape, Façadeshield Tape or Flextite UV Tape.